VOA News Oct 30, 2017. 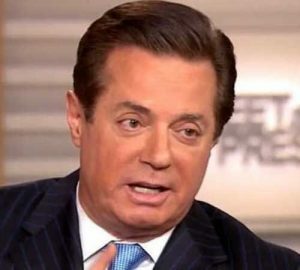 U.S. media reports say Paul Manafort, who was President Donald Trump’s campaign manager for a brief period, has been instructed to turn himself in to authorities on Monday, as part of a special counsel investigation into Russian interference in the 2016 U.S. presidential election. A federal grand jury on Friday approved charges in the probe led by special counsel Robert Mueller, according to several major news outlets that reported the indictment could be made public as soon as Monday. Both CNN and the New York Times says Manafort, who had wide lobbying interests in Ukraine and links to Russia, has been asked to surrender to authorities. The Times says Manafort’s former business associate Rick Gates would also be turning himself in. Manafort served as Trump’s campaign manager from June to August in 2016. In addition to Mueller’s investigation, there are separate congressional probes into Russian meddling and possible links between Trump’s campaign and Russia. He further blamed the Russia investigations for taking attention away from Republican efforts on tax reform. “Is this coincidental? NOT!” Trump said. Ty Cobb, a member of Trump’s legal team, said in a statement that Trump’s comments were not related to the developments in Mueller’s investigation. “Contrary to what many have suggested, the President’s comments today are unrelated to the activities of the Special Counsel, with whom he continues to cooperate,” Cobb said. Mueller was believed to be examining activities of Manafort as well as former national security adviser Michael Flynn, who was fired by Trump less than a month after he took office for lying to Vice President Mike Pence and other officials about his contacts with Russia’s ambassador to Washington.